Physics can be both aesthetic and technologically relevant. The journal Nature chose a University of Twente image of drops from a nozzle of a piezo-acoustic inkjet printer as one of the ten most beautiful photos of 2014. Thanks to the research, scientists can predict and control the behaviour of small drops. The photo was made within a FOM Industrial Partnership Programme with Océ. The drops have a volume of just ten picolitres and a speed of 10 metres per second (36 km/h). The researchers used a flashlight that emits pulses of eight nanoseconds. This enabled them to prevent motion blur. 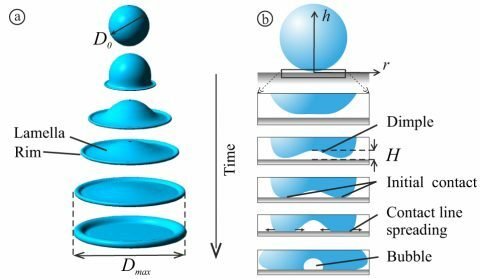 The drops are not just beautiful: As the researchers took two photos rapidly after each other they could determine the speed profile of the drops. They then compared these data with their numerical models. The high quality of the digital images was vital for this. This quality enabled the researchers to precisely determine the edge of the drops. The researchers can now control the method so well that they can determine the rheological properties of non-Newtonian liquids under extremely strong shear stress. Standard rheometers can measure the viscosity up to a shear stress of 1000 per second. The new method can measure up to 100,000 per second and it can therefore be used for a range of new applications. Not just the formation of the drops but also their behaviour when they impact on a surface is important. The researchers ask themselves the following question: how does a drop with given speed and diameter spread for given ink properties? In this case making photos with high-speed digital cameras is also the best way to capture the dynamics. The researchers supplement the images with numerical simulations. With this they want to understand the behaviour of the drop. To their surprise an air bubble formed under an impacting drop. The scientists have now found an explanation for this. Just before the impact of the drop the air pressure under it increases. First a dimple arises, which then forms into a bubble due to surface tension. For most applications such a bubble is a nuisance because it reduces the contact between the surface and the drop. However for some applications such a bubble is an advantage because, for example, the optical properties of the drop change. Thanks to the combination of experimental, numerical and theoretical studies, the scientists now know under which conditions the biggest bubble under the drop is achieved. Velocity Profile inside Piezoacoustic Inkjet Droplets in Flight: Comparison between Experiment and Numerical Simulation, Arjan van der Bos, Mark-Jan van der Meulen, Theo Driessen, Marc van den Berg, Hans Reinten, Herman Wijshoff, Michel Versluis, and Detlef Lohse , Phys. Rev. Applied 1, 014004 , 27 February 2014. (a) Numerical simulation with an interface tracking volume of fluid solver (Gerris) of a drop impacting on a surface. (b) Diagram of the process that leads to the 'enclosure' of a bubble under the impacting drop. This series of photos of inkjet drops about ten picolitres in size and with a speed of ten metres per second made the top ten of Nature's photo overview.